For the 12th anniversary of September 11, 2001, Lamar Advertising Company is launching a digital billboard campaign. The purpose of the campaign is to help maintain awareness about the tragedy that occurred that day at the World Trade Center. 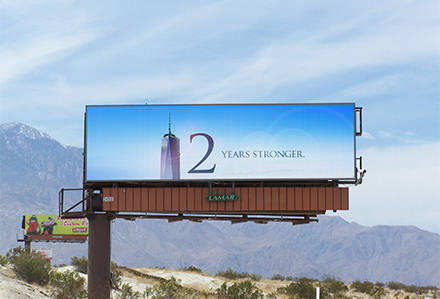 The billboard design reads “12 Years Stronger” to commemorate the anniversary of 9/11 and remember those lost in the terrorist attacks of 2001. The campaign is running on Lamar’s digital billboard space nationwide. For more information about the 9/11 Memorial Organization, please visit 911memorial.org. Learn more about other campaigns devoted to remembering 9/11. Local law enforcement officials are hoping a new tool along U.S. 41 will help police find people who have outstanding warrants. 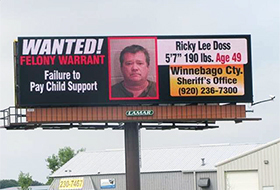 Through a partnership with Lamar Advertising and law enforcement in Winnebago County, Digital Billboards are now advertising mug shots of those who are wanted. Tennessee football is ready for the season to get going, and it is sporting an entirely new look in 2013. 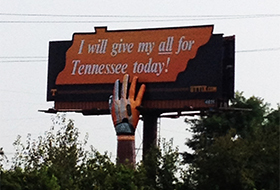 The Vols have a new coach, new uniforms, and now, a fancy new billboard marking their territory.